Simmer the carcass for at least two hours to get real flavor. You want the meat to fall right off the bone. I grew up learning that you don’t waste food, and that includes what’s left on the turkey platter at the end of Thanksgiving dinner. Surprisingly, so many people toss the bones and all the hearty meat left on them in the trash. Especially when making soup or stew is so easy. There are several methods (you’ll find tons of recipes online), but this is the one I’ve used for years. It’s simple, and it makes for a hearty soup – or, for those who like it – thick, bread-dipping worthy stew. Put the entire turkey carcass (including all the little remnants of meat and skin) in a big bot. Add enough water to cover the carcass (usually around 4 – 5 quarts). Add salt, pepper, celery stalks, onion and bay leaf. Bring to a light boil then drop heat and cover. Simmer for 2-1/2 to 3 hours, until the meat falls off the bone entirely. 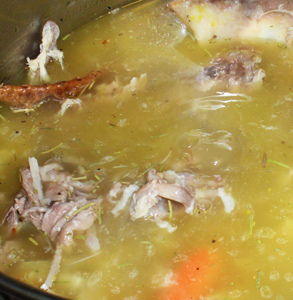 Use tongs to pull the larger carcass bones out of the stock. Using a colander and large pot, dump entire cooked contents, allowing the liquid to pass through to the large pot. Place all solids left in the colander into a large bowl. Refrigerate stock and solids separately until cooled. Overnight is fine. For the meat, use your fingers to shred, as well as to get rid of any fine bones or cartilage. You’ll use this meat for the soup or stew. For the stock, use a shallow metal spoon to lift off the layer of fat that’s solidified. Pour stock and meat into a large pot. Add carrots, celery, potatoes, and any other veggies you may like (some like canned tomatoes or cabbage). If you opted to add noodles, throw those in there, too. Simmer for about 30-40 minutes, until vegetables reach desired tenderness. To turn your soup into stew (which is a thicker, heartier variety), you can use flour or cornstarch. Simply mix a few tablespoons with water, bring soup to a light boil, and slowly add the mixture. Stir frequently until it reaches your desired consistency. Of course, if you’re turkey’d out and want to wait, you can freeze the carcass for a month or so. You can also freeze the stock and meat for about two months. I usually simmer the carcass the night of Thanksgiving because it’s easier later to just pull the goods out of the freezer. Once done you can freeze your soup or stew for several months. This is how I enjoy a turkey feast in January. Are you a “carcass simmerer”? Have any tips or tricks to add?